Mike Vernon is a well-known name in Blues and Rhythm and Blues, primarily as a producer. Mike has worked with the biggest names across the years and the genres and has produced albums for the Bluesbreakers, Bowie, Chicken Shack, Focus and Level 42 amongst many others. He is also significant in the blues world as the founder of the groundbreaking Blue Horizon record label, having signed such artists as Peter Green, and Rory Gallagher. Although less well known for his vocal capabilities, he made a success of that too; Mike was singing with The Olympic Runners and Rocky Sharpe and the Replays throughout the 70s and 80s. 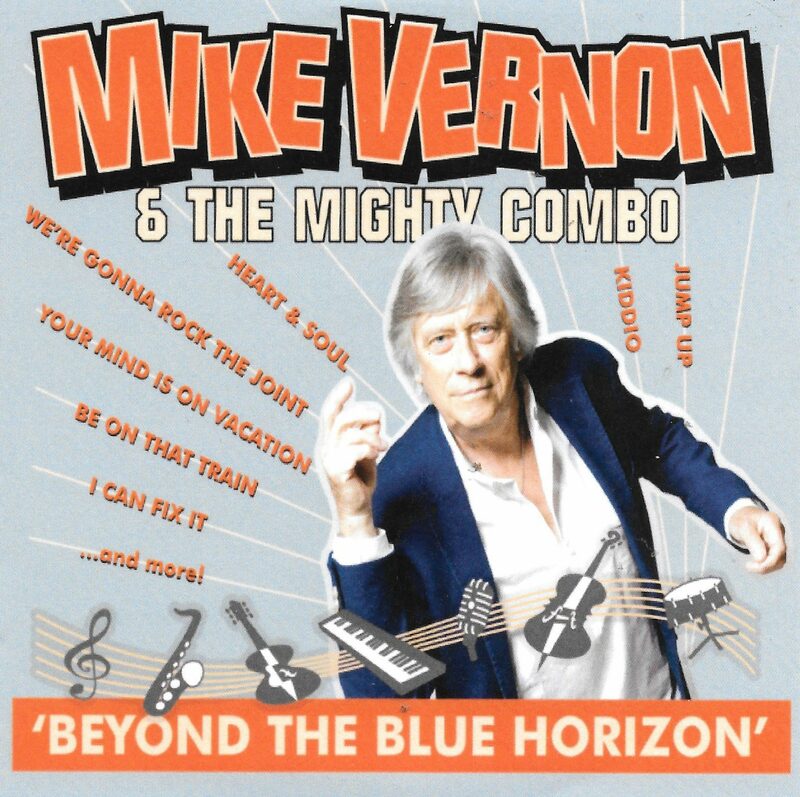 With a new line up, Mike Vernon and the Mighty Combo has released an album of nine originals and three cover versions named, quite aptly, Beyond the Blue Horizon. He is touring extensively too across the UK and beyond. We’re Gonna Rock the Joint starts the ball rolling with this sax led R’n’B in a typical arrangement for this kind of song. It’s well executed and reveals that vocally, Mike can certainly carry a tune well. It benefits from the guitar solo in the tone and style of the era and, although it brings nothing new to the table, it flows nicely. Kiddio was a hit for Brook Benton in 1960 and gets an update courtesy of Kid Carlos’ nice guitar phrasing and class solo. Heart and Soul sounds more show time/vaudeville in its stylings and, despite the quality musicianship, it is the weakest here. I Can Fix It (no, not Bob the Builder, mercifully) takes us back with an enjoyable R’n’B song as the piano and guitar solos provide the highlights. (I Don’t Why I Love You) But I Do was a hit for Clarence ‘Frogman’ Henry in 1961 and this fairly faithful reading will bring back memories to those of us old enough to remember it! The sax and guitar work well together in a duet in the middle of this one. Be On That Train starts with a great guitar introduction before reverting to a more archetypal structure, for a song about a train. The backing vocals and horns make this sound fresh from the 60s, if that is even possible, and the guitar sounds like Hank had a hand in the recording. Your Mind is on Vacation is from 1976 and written and recorded by the pianist and composer, Mose Allison. As with the original, the cover keeps the blues/jazz feeling, particularly with the smooth piano and guitar. I was a little disappointed when I realised that the track Old Man Dreams didn’t refer to the wonderful poem of the same name, written by Oliver Wendell Holmes in 1854… it is a poem most of us of advancing age would relate to: “Oh for one hour of youthful joy! Give back my twentieth spring! I’d rather laugh, a bright-haired boy, than reign, a graybeard king. Off with the spoils of wrinkled age!” Vernon’s sentiment isn’t that far away however and the song is graced by such a superb piece of guitar, which (with eyes closed) could have been Peter Green playing on this great blues tune. This head and shoulders the best of the bunch. Jump Up is another ‘new standard’, which reflects the 60s so well and yet still brings the R’n’B sound up to date. The sax brings in a touch of jazz before the guitar again steals the show. Red Letter Day keeps to the formulae and is pleasant enough but again, breaks no new ground but has a mighty guitar solo. A Love Affair with the Blues is, unsurprisingly, a blues tune mixed with a slow jazz/swing-based backing. The changes are rung here, with a harmonica solo presaging yet another ‘period’ guitar solo. Hate to leave (Hate to Say Goodbye) finishes the album an uptempo rock ‘n’ roll song which, from the lyrics, will be their closing number when they play live. It gives everyone a chance to finish in style, the sax then guitar solos saving the song becoming a cliché. This is a difficult one, to sum up…every song, every musician is very good and yet, it just doesn’t have anything new or particularly different to offer. If you like rock ‘n’ roll and rhythm and blues you will definitely enjoy this: it takes you back in an authentic way to the days when this style ruled the airwaves and the dance halls. The big plus is the unknown (to me anyway) guitarist Kid Carlos…he makes the whole album worth listening to as his guitar evokes the time and still manages to bring a freshness to the playing. Vernon brings an essential authenticity through his experience and expertise, I only wish he had done more to make the tracks differentiate themselves from the wealth of this kind of material out there. Still a good listen though.